One definition of a "B Movie" is that when a door slams, the walls tremble. Well, it's one thing to see a "B Movie," another to appear in one as an actor, and yet another to actually produce one. I've done all of these to one extent or another, but I also now find myself living in a "B Movie" -- literally. 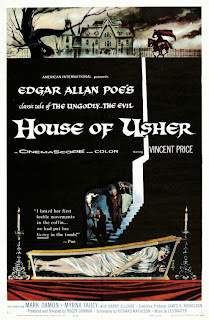 In 1960, Roger Corman brought to the motion picture screen in marvelous CinemaScope a truly chilling cinematic experience -- THE HOUSE OF USHER, Edgar Allan Poe's overwhelming tale of evil, decadence and torment. There is no external monster or villain in this stylish, supernatural horror story, rather it is the house itself that possess such cadaverous gloom and depravity that it is literally collapsing under the weight of Satanic, self-destructive forces left behind by the evilness of those who built it. Which brings me to the Nowotny Homestead located at Latitude 29 50' 56" N, Longitude 90 27' 07" W. You see, I, too, live in a home that is literally falling apart thanks to a totally disreputable builder whose shameful, slovenly and slipshod construction work leaves me just as cataclysmically condemned as Roderick Usher (Vincent Price in one of his best performances). You may be surprised to learn that the construction company involved wasn't Kaufman & Broad. Nor was it Pulte or David Weekly or Centex or even the dreaded D. R. Horton hombres. Let's just say that the Satanic, self-destructive forces left behind by the evilness of the "builder" responsible for my crumbling cardboard castle was just an ordinary Joe. Terrifying fear beyond human comprehension prohibits me from naming names, but here's a hint: If you ever see a concrete driveway being reinforced with dental floss instead of rebar, or if you run across interior walls painted thinner than (you guessed it) a Republican's lips, or if you happen to notice a stucco exterior with more exposed cracks than a plumber's convention, I'll bet a breakfast taco that the buckaroo in charge is the same bumbling bozo responsible for my abysmal abode. Bring out the catafalque and the coffin -- like Mr. Price, my days are doomed thanks to "The Ungodly...The Evil...HOUSE OF USHER" (Comal County Version).